My family loves this jam! When I was about to take the jars into storage, my kids were yelling and pleading to keep one up in the kitchen for them to eat. 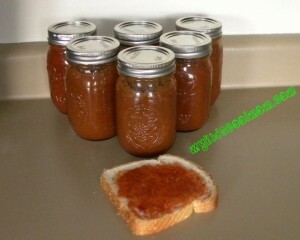 It is a much cheaper way to make your own strawberry jam, especially if you grow your own zucchini. Yes, zucchini. There are no strawberries in this recipe. 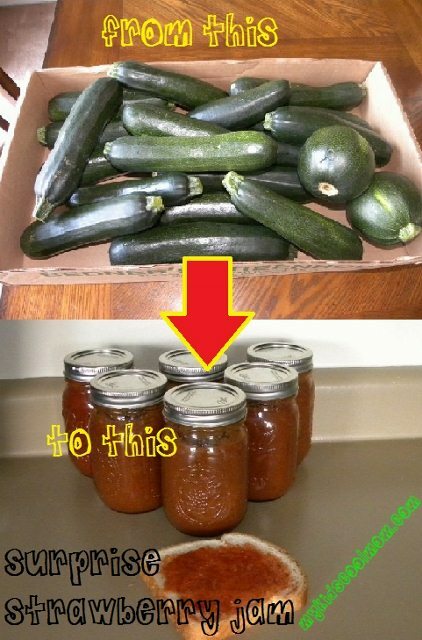 So how do you go from zucchini to strawberry jam? Here’s the recipe. First, you do not need this much zucchini. Those 20 zucchini made about 24 cups of zucchini puree. I used some to make the jam, some to make some zucchini bread and then I froze the rest in Ziploc bags. 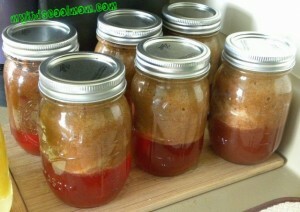 ***If you want the jam bright red, you may want to peel the zucchini before blending. You will most likely need more zucchini as the yield will not be as large. If you don’t mind the green tint, leave the peels on. This recipe makes 6 pints of surprise strawberry jam. ***Update: We made grape jam using this recipe. We just used 3 boxes of grape jello mix. Warning though, it does not come out purple. It comes out with a deep green color. It still tastes delicious though. 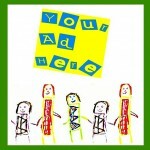 My kids don’t mind at all. Actually, they think it’s pretty cool. This would be a great addition to my Halloween themed lunches. Muah ha ha. Begin by blending the zucchini and water in a blender until it is smooth puree. Transfer the puree to a pot and heat it with the sugar until all of the sugar is dissolved. Once the sugar is dissolved, add the lemon juice and the strawberry jello packages. Heat and stir for another 5 minutes to ensure the jello mix is completely dissolved. Canning: Ladle the jam into sterilized jars, leaving 1/4 inch of head space. Wipe the rim and threads with a clean cloth and top with the lid and ring. Place in boiling water with at least 2 inches of water covering the jar. Boil constantly for 10 minutes. Let it sit for 5 more minutes until removing from the water. Let sit for 24 hours to ensure a proper seal. Refrigerate any jars that did not seal correctly. Once it is cool, just shake it up before you store it. Even if it separates in storage, just shake it up again before you place it in the refrigerator prior to use. Once in the refrigerator the gelatin will set nicely. Freezing: Place in freezer containers and allow to thaw in the refrigerator before use. Once cooled or placed in the refrigerator, it will look like this and be amazing to enjoy! Conveniently re-pin this here so you have quick access to the recipe! great – thanks! we keep kosher so sometimes we can’t find the exact same products in the same sizes that non-kosher people can find. I just finished making my first batch! It is very runny, will it sit once I put in the refrigerator? Mine hardened up after it cooled. Did yours end up being okay? My neighbor has been doing this same technic for years and selling them. She’s mentioned that she’s had a few batches that didn’t set up. Her solution was to use it as syrup. Her customers have really loved it. Don’t be so worried if it doesn’t work… just make pancakes! Mine came out runny too. What’s that all about? How can we thicken it? How long does it keep when canned and not opened? My concern is that the jello boxes have expiration dates. Jolene, we always ended up using ours within a few months. I would definitely suggest using it before the expiration of the jello. Thank you for pointing that out. Do you think instead of the strawberry jello you could use unflavored gelatin and then a flavoring or extract? That might work since you are replacing both the flavor and thickening agent. I’d love to hear if it works. Absolutely, but you will have to use it up soon. I haven’t tried freezing it yet. I would assume it would keep in the refrigerator for a week. just wondering if you have tried using pectin? I know the gelatin will set up when refrigerated, do you think the pectin will make it set up like normal jelly? Thanks for the recipe! I haven’t tried using pectin. You would need to follow the box directions so it would set though, I would assume. I’m not sure though, if the sugar content would need to be adjusted. Made this today. It is amazing! A great way to use up some zucchini! Thank you!